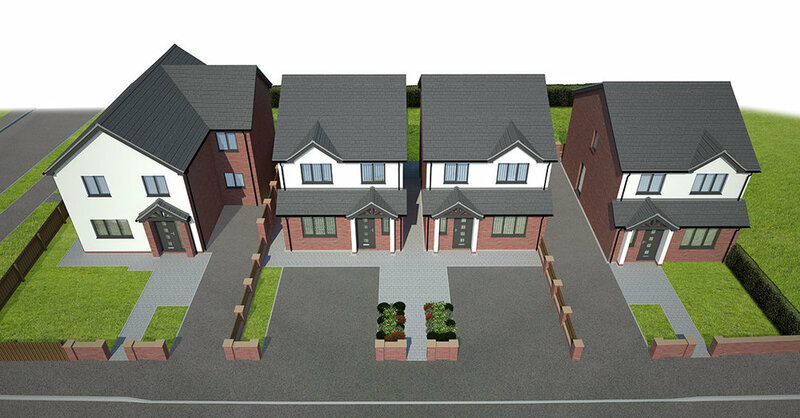 Our clients Poplar Farm Developments Ltd purchased this site with planning approval already in place for four detached family homes in early 2016. We were appointed to redesign, construct and oversee this scheme through its construction. We improved the overall design and saleability of the new build homes to create a desirable development for everyday modern families. Assessing the surrounding homes the site is located between two post war developments, one from the 1960's and the other a more recent mid 1990's estate. Because of this we soon determined that the development needed to have its own identity rather than blend in with the established order. The site topography was also a challenge, sloping steeply away from the front down to the back of the site. This results in rear gardens being almost 2m lower than floor level inside the houses. To make sure the houses retain a positive relationship with the gardens despite this dramatic level change we have formed Juliet balconies from the living kitchens to the rear, allowing the inside to open up over the gardens. Whilst the form and site Layout of the houses remains very similar to the previous planning approval, the current scheme has embraced a much more modern and contemporary design philosophy. We have specified dark grey fascIas and windows with areas of crisp white render designed to contrast with the red brickwork. The entrance canopies retain simple architectural characteristics as the slender rendered pillars frame the entrance to each home. Currently under construction, these homes should be completed and ready to buy mid-2017.